Adding a personal touch to your kitchen or bathroom doesn’t have to be a huge, expensive project. 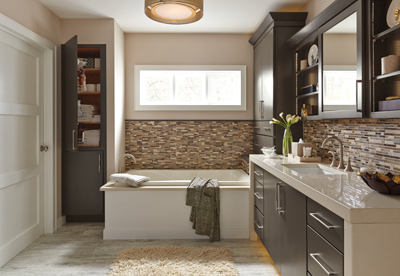 At our showroom, it can be as simple as adding backsplashes. In Highland, IL, these are some of the most desired features in a home, and with good reason. They’re easy to install and are completely customizable—no two are exactly the same. We have displays available in a multitude of materials from reputable manufacturers with guarantees to give you peace of mind. Whatever type of decor you like, we’re prepared to match it perfectly. Both our bathroom and kitchen backsplashes come in dozens of different designs, colors, textures, and styles to please any preference. All of them are made to be durable enough to stay on your wall for years. We’re happy to help you with every part of your purchase from the selection to the installation. Our team has experience in designing kitchen and bathroom backsplashes; whatever the size or scope of your space, it’s no problem for us. In addition to its ability to make a space look more pleasing and adding value to your home, a backsplash offers functional benefits as well. Stone tile protects your walls from water and food messes that may occur while cooking and cleaning. It offers a natural and proven resistance to chips, heat, and scratches; so you’ll never have to worry about what will happen if you make a mistake while making a meal. Your backsplash can handle it with ease. The endless design possibilities allow you to get creative and play around with different patterns, shapes, and color schemes. Diamonds, squares, bricks, tile checkerboards, and floral designs are some common ones, but you’re hardly limited to those. We’re happy to offer you inspiration should you need it, because we’ve completed a number of these projects and know-how to coordinate with any style. Whether you lean toward the classic white background with unique swirls of marble or something more modern, we can install whatever you want wherever you want. Installing a backsplash is easy and quick, and it puts a permanent stamp of personality on the wall and adds value to your home. Our crews are trained in handling heavy or fragile materials like glass and others, and since we have all of the necessary installation equipment, you can trust that the job will be done right. We can add a backsplash to any space in any home. Contact us for a free consultation and expert help. We serve the residents of Highland, Troy, Greenville, Trenton, and Carlyle, Illinois, and the bordering neighborhoods.